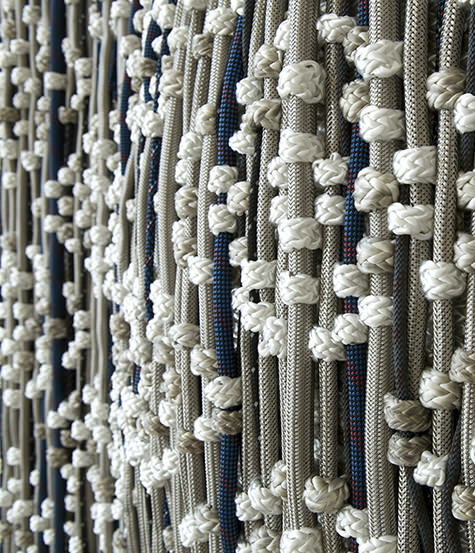 Internationally exhibited Spanish-Australian artist Dani Marti, trained in Catalan tapestry techniques, is a master of knots and maker of densely woven relief works. In this video, he talks about his solo show Black Sun, now at Fremantle Arts Centre for the 2016 Perth International Arts Festival. Marti’s complex, large format entwinings of industrial, domestic and personal materials—including, for example, fibres, rubber, wire, rope, necklaces, and, in one glittering work, steel scourers—generates immersive viewing. His films are contrastingly documentary in style, but as rich in intimate detail. Look out for Laetitia Wilson’s review of Black Sun in our 24 February E-dition. Dani Marti, Shield – Study for a Portrait – Take 1, 2015, stainless steel braided hose, polyester, nylon, rubber and leather on aluminium frame.